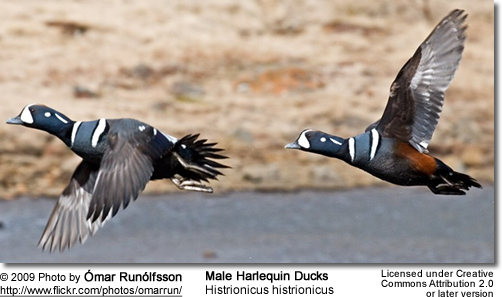 TheHarlequin Duck (Histrionicus histrionicus) is a small sea duck. In North America it is also known as Lords and ladies. Other names include painted duck, totem pole duck, rock duck, glacier duck, mountain duck, white-eyed diver, squeaker and blue streak. 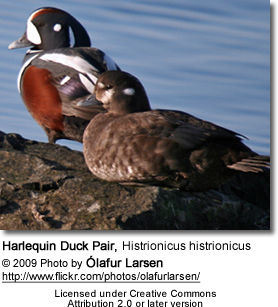 The Harlequin Duck takes its name from Arlecchino, Harlequin in French, a colorfully dressed character in Commedia dell'arte. The species name comes from the Latin word "histrio", "actor". Today, this is the only species of its genus. Two prehistoric harlequin ducks were described from fossils, although both were initially placed in a distinct genus: Histrionicus shotwelli is known from Middle to Late Miocene deposits of Oregon, USA and was considered to form a distinct monotypic (one single species) genus, Ocyplonessa. Histrionicus ceruttii, which lived in California during the Late Pliocene, was at first taken to be a species of the related genus Melanitta. Harlequins have smooth, densely packed feathers that trap a lot of air within them. This is vital for insulating such small bodies against the chilly waters they ply. It also makes them exceptionally buoyant, making them bounce like corks after dives. Both adults have a white ear patch. Adult males are slate blue with chestnut sides and white markings including a white crescent at the base of the bill. Adult females are less colorful, with brownish-grey plumage and a white patch on the head around the eye. Immature Birds: Look like adult females, but have darker belly. The Female Bufflehead Duck has one spot on face and extensive white in wings. Scoters are larger, have more sloped foreheads and larger bills. Their breeding habitat is cold fast moving streams in north-western and north-eastern North America, Greenland, Iceland and western Russia. The eastern North American population is declining and is considered endangered. Possible causes include loss of habitat due to hydroelectric projects and loss of life due to oil spills near coastal areas. They are short distance migrants and most winter near rocky shorelines on the Atlantic and Pacific coasts. They are very rare vagrants to western Europe. They are usually found near pounding surf and white water. The nest is usually located in a well-concealed location on the ground near a stream. It is often hidden under rocks and in crevices. Copyright: Wikipedia. This article is licensed under theGNU Free Documentation License. It uses material from Wikipedia.org. Additional information added by Avianweb. 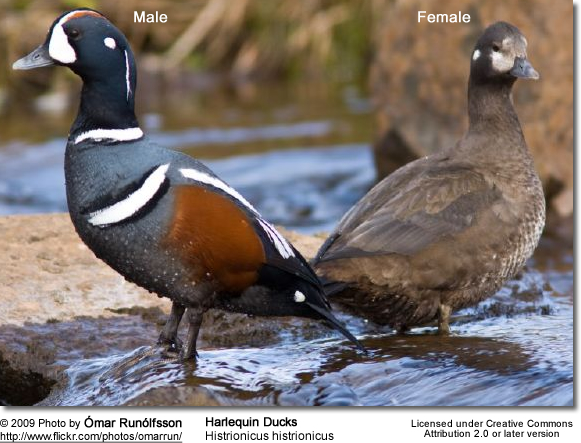 Harlequin ducks feed by swimming under water or diving to the bottom of fast-flowing rivers for food. Their diet consists mostly of insects, insect eggs and larvae, mollusks and crustaceans. Ducks generally feed on larvae and pupae often found under rocks, as well as aquatic animals, plant material, seeds, small fish, snails and crabs. Foods that can be fed to Ducks, Geese and Swansto survive cold winters and remain healthy when food is scarce in their environment.